Inter milan has secured a 2-1 win over Fiorentina at San Siro on tuesday, After defeating Tottenham in the Champions League and Sampdoria Serie A in the past week and has also earn another three points over Fiorentina to ease the pressure on Luciano Spalletti. Inter milan started leading when referee Paolo Silvio Mazzoleni punished Vitor Hugo for handball inside the penalty area after a VAR review, Mauro Icardi opening his league account for the season from the resulting spot-kick. The visitors thought they had secured a share of the spoils after 52 minutes when Federico Chiesa's long-range drive took a huge deflection off Milan Skriniar to scored an own goal. Fiorentina started confidently and saw an early Kevin Mirallas effort crash back off the base of the post. Inter then speedily woke from their slumber and carved out a hat-trick of superb chances. Antonio Candreva's powerful volley arrowed just over the crossbar, Icardi fired straight at Alban Lafont after a sweeping counter-attack and Ivan Perisic whipped a first-time effort agonisingly past the far post. At the other end, Giovanni Simeone hit his effort straight at Handanovic after being played in by Chiesa before Inter took a fortuitous lead on the stroke half-time through Icardi's contentious spot-kick. Clearly aggrieved by the decision, the visitors started the second half brightly and were rewarded when Chiesa's drive was diverted in by the unlucky Skriniar. 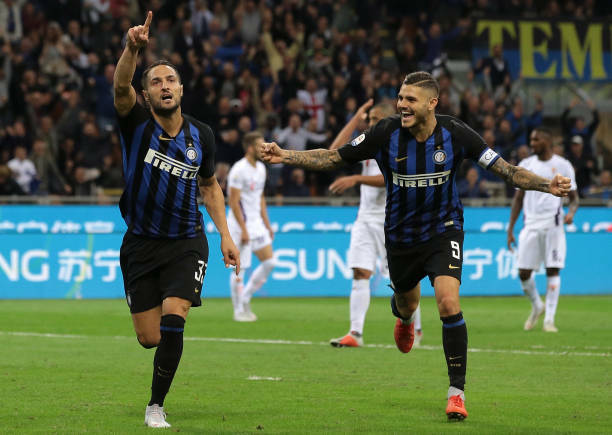 Inter scarcely looked like finding a winner during a tepid second half, but D'Ambrosio burst forward to collect Icardi's pass and stroke past Lafont in the 77th minute to secure Victory for the host.